This world lives and breathes, just like we do. It's a beautiful process that will always amaze and awe. 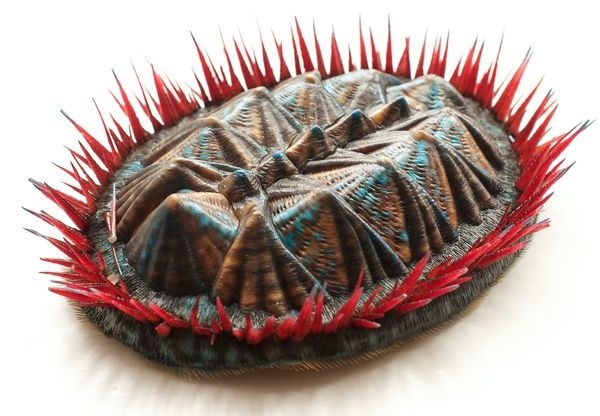 Back in September, an armored mollusk, that is approximately 390 million years old, was brought back to life with the use of 3-D technology. The small, oval-shaped animal was visually unknown. Meaning, it was a mystery to the eyes, but not to the imagination or to records. But when a fossil was discovered in 2001 in Ohio, specialists were able to piece the image together. In order to generate the creature, a team created a 3-D model of the fossil. Then they put the puzzle together, completely virtually. The resulting image was not what they had imagined; the team originally thought the mollusk was more shaped like a worm with a long line of armor going down its back. Instead, they got the image below. Next, the team decided to make a palm-sized life-like model. It looked exactly like the image below, complete with multicolors and texture. When choosing the colors, the team referred to the modern chiton mollusks. With the model, they could hold the monster in their hands. The researchers got a chance to make educated guesses on what the mollusk's predators were and where it may have lived. They supposed an animal would have to have a fairly strong jaw to crack this thing, or a large beak would work, too. This technology is a great thing to have when trying to learn about the past. This way, we can find out what happened to the mollusk and how it disappeared. Was it because of global warming and the waters got to hot for it to handle? Was there an abundance of predators? With technology, we will be able to find those things out soon. It's quite exciting, in my opinion. It can also tell us about the future. If this mollusk died off, will that happen with other similar species? Only time and research will tell. Because of a new disease that has been spreading for the past few decades, frogs and other amphibian species are close to becoming extinct. The disease is called chytrid; it's a fungus that grows on the amphibians. Since scientists have discovered it in the late 1990s, it has nearly killed off 300 species. But, scientists have made a very recent discovery. The fungus is being harbored and carried by crayfish. When frogs re-enter the abandoned water, the fungus leaves the carriers and feeds on the frogs once again. Taegan McMahon, an ecologist from Tampa, found this while conducting a study on chytrid. She found that the fungus both kills and parks itself on the crayfish. She put the carriers in with some tadpoles, and the tadpoles ended up getting infected. Later, she visited a pond where frogs were being recorded as declining quickly. There, she discovered crayfish who were infected with chytrid. But, the crayfish are not solutions to everywhere where the frogs are dying. Scientists are looking at other species that could carry chytrid and doing it fast. I can't believe I didn't know about this. I didn't realize that frogs were dying because of a rare fungus. This thing is the real deal and needs to be taken care of as soon as possible. It should be a top priority on biologists lists because it could in some way impact humans, too. You never know- it could be the cause of cancer. There are about 1,500 active volcanoes around the world. Not only are they said to have created 80% of earth's land, but some are still making this land. In the Pacific Ocean, there is a place called "The Ring of Fire" where most of these active volcanoes are located. Earth is made up of tectonic plates that are constantly shifting and that's what makes the volcanoes. They work like vents, letting the fiery hot magma from earth's inner core travel to the surface, where it becomes lava. There are two types of volcanoes- composite and shield. In Hawaii, there is a volcano named Kilauea that erupts all the time. Although these natural disasters have killed and destroyed, they are also helpful to us. They created much of the air we breathe, rich soil for farming, and many countries use their subsurface heat to create geothermal energy. Volcanoes are fascinating. The way the earth is already trained to make land and let off some steam astounds me. I never knew of The Ring of Fire and I want to go there sometime, if it's possible. I did not realize volcanoes are beneficial to mankind. If we can make geothermal energy from the heat of volcanoes, does that mean we could store it too? Is it an energy resource we could use just like windmills? It would be interesting if we could actually use it as an alternative energy source, just like solar energy. There are certain invasive species that are really hurting our ecosystems and CNN has a solution to getting rid of them- Eat them! With the concern of pesticides and bacterial contamination, eating some of these strange intruders has become a more appealing idea. Take the lionfish for example. Relocated to the Florida Keys, they are breeding year round, creating a huge amount of fish that are no only killing off other demanded fish species, but they are hurting the lobster industry, too. Based on research and the observation of their quick reproduction, lionfish could potentially shift the whole Caribbean ecosystem. The answer that some people are suggesting is to catch these fish, making it a new industry, and serve them up on plates. Andrew Zimmern, the host of "Bizarre Foods" on the Travel Channel, makes a excellent point saying, why let this potential food go to waste while there are starving people in the world. I agree. If these animals and plants are really hurting ecosystems and might be harmful to us, why not eat them? If they won't hurt us, why not let them feed some starving children? We don't have enough food in this world, in my opinion. Let's organize a new program where professionals catch these suckers and sell them, for an affordable price, to hungry people. It's a cause most people would enjoy being a part of, plus it will create new jobs. On the science side, I believe it's a much better solution to the problem than sending a deathly pesticide into the ocean that could harm other life, including ours. No, catching them and eating them is the best answer.